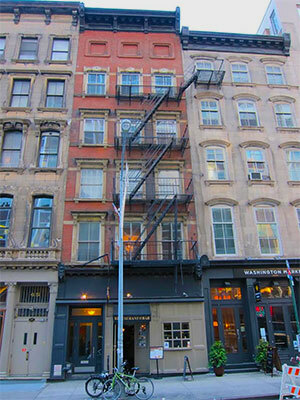 43 Murray Street is a brick loft building located in TriBeCa, only a block from City Hall, very close to the Northwest corner of Church and Murray Street. A pub, Woodrow’s, is located on the first floor of the building. The front entrance to my office is just to the left of Woodrow’s front door. Please press the button for #3A – marked “Meyerhofer/Kwok” and I’ll buzz you in. #3A is located up three flights of stairs. NOTE: Please provide at least 24 hours notice if you intend to cancel – otherwise you will be charged for a missed session. PATH: Take the NJ PATH Train to the World Trade Center PATH Station. When you exit the station, walk 3 blocks North on West Broadway and take a right on Murray Street. 43 Murray Street is on the North side of the street. NY Waterway Ferry: Take the Waterway Ferry to the World Financial Center. When you exit the Ferry, walk one block East to North End Avenue. Walk one block North to Murray Street and take a right and walk approximately 4 blocks until you arrive at 43 Murray Street. Driving: There is a parking garage located across the street: Church Street Parking LLC 110-118 Church Street. Enter 54 Murray Street Between Church and West Broadway.